After finding a recipe for white bread on The Barefoot Kitchen Witch, I knew it was time to try out another bread escapade. Recall that my last successful bread escapade involved VeganYumYum’s Poolish Foccacia, and it was delicious. Time-consuming and a learning experience to be sure. This time, I was going to make sure I wasn’t caught off guard (I failed at that, by the way). I’ve been wanting to make wheat bread for a while, to be honest. I like making bread in general; I just wish I had all the time I needed for it and I often don’t lately. I don’t know why, but I’ve been waiting on the right recipe to get started again (and for my supply of storebought loaf bread to finally vanish, which it did at supper last night). I’ve got plenty of recipes, including several pages’ worth out of Country Wisdom & Know-How, but none of them really called to me. Jayne’s was apparently the recipe and I’m so glad I used it. The first thing that drew me to it was that it read very simply. Not a bunch of sugar added, or lots of involved steps for mixing, or mixing by hand forever if one doesn’t own a stand mixer. Just mix and let the yeast bloom, then mix in dry and wet ingredients, stir it all up, knead it for a bit and then… let it rest. Let it rise. When the yeast was blooming, I’ll admit: I didn’t like the smell, at first. It reminded me of the fridge in the last apartment, when my roommate wouldn’t clean it out and I hadn’t really been home much. Yuck. But it grew on me (no pun intended! 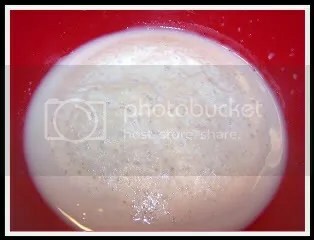 ), and I contented myself with knowing that by the time the yeast had done its job, the house would smell fantastic. When the dough finally started coming away from the bowl and sticking together proper, I stopped mixing it. I learned my lesson from the foccacia – I didn’t want to overexcite my gluten. I slapped it out on my recently-acquired floured board and kneaded it. Knead your bread lovingly. Don’t kill it. (Although I will admit I slapped it down on the board a couple of times more. 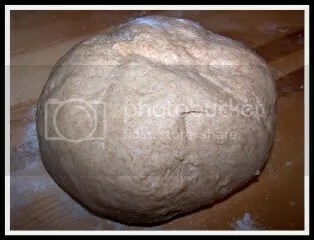 Is that dough abuse? Or tough love?) I stopped kneading when it felt right, although little needling voices in the back of my head told me ‘No! It’s too sticky! It needs more work! More flour!’ I oiled up my big bowl, ignored those voices and let my dough rest comfortably in its bed of oil, under cover of plastic. Then I went to turn out horses from the barn and do my chores. I figured the hour and a half I’d be gone would be plenty of time, and I wouldn’t feel the need to check it every ten minutes. This is where I started to get concerned. I came back from chores, washed the feed dust and hay off my hands and punched the dough back down. I let it rise again (seen above) and it only rose three-quarters of the way as before. Maybe I let it go too far the first time? I chalked it up to the mix of bread flours – I used half white wheat and half unbleached regular to get what I wanted. Eventually, I’d decided it had gone plenty of time without rising further and was ready to get prepped for baking. I took it out, shaped it as directed and let them rest while I got together my loaf pans and started the oven to preheating. My confidence got a little boost here – when I separated the dough by hand, having no scraper blade to my name, the dough was visibly elastic and resistant to coming apart. It was a little relief, backed up when I patted out the balls for further shaping. The dough was remarkably springy, which made me very happy. I didn’t want to lose this batch of dough to neglect like the last time I tried for loaf bread (the time of which we do not speak, where 354’s momma tried to bake it for me and it came out like rocks). I started to oil the pans, then decided against it because they were non-stick to the touch, and I didn’t want to grease up my bread. I had to go on a little faith. 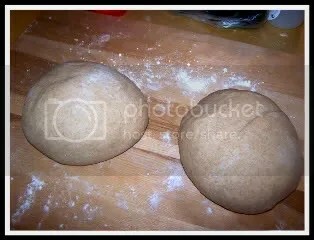 I patted out my dough balls, rolled them up and sealed the edges, then flipped them into their respective pans. I covered them with a dishtowel and set the pans on the stove, sitting on a cooling rack, to rise. I would like to make note that at this point, it was around 2300 (11:00 pm for you non-military timers). I was sleepy and kind of hurting, but I was not going to leave the bread for tomorrow. No sir. Finally, around ten ’til midnight, they were risen as much as they were going to rise. 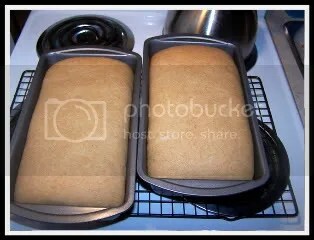 I could’ve baked the one on the right first and let the left pan rise a little more over the right front burner, but I was sleepy and the loaves were risen. So I popped them in the oven, pushed the button on my timer and got back on the computer to wait not-so-patiently. The prettiest little squatty wheat loaves I’ve ever seen! Like the second rising, the dough came up a little short, but that’s okay. 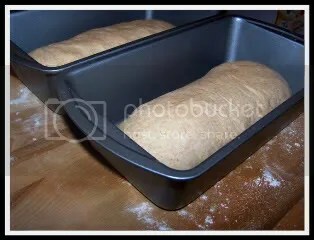 When I up-ended my pans, the loaves slipped right out, steam coming out from under the bottoms. I tapped the bottoms dutifully, pleased with my hollow thumps. To keep the crust soft, I rubbed butter over the tops, covered the loaves with plastic and a dishtowel. 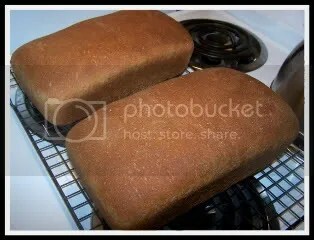 Then I went to bed, happy with the smell of wheat bread in my house. The tops were pleasantly soft and wrinkly. I started to cut into a loaf for breakfast toast, but I had one bowl of cereal to get rid of. I made myself wait for lunch. And as I sit here, happily eating my turkey and provolone sandwich on homemade wheat, I am beyond pleased. It’s thick and soft, unbelievably fragrant, and it has a real taste! Nothing like storebought wheat bread, which at this point is going to just be something to hold my sandwich innards together. I don’t know that I can ever go back to storebought now – why would I, when I have the means to make my own, with a loaf to eat and a loaf to freeze for later? I haven’t bothered to do the cost ratio between the two – a side experiment in decreasing my food costs and increasing my self-sustainability – but hopefully making my own bread is cheaper in the long run. Even with grain prices at record highs, I can’t see how it wouldn’t be. 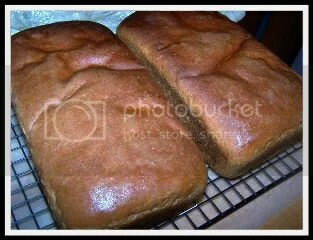 Jayne’s recipe for Soft White Bread is listed here, with gobs of clear, instructional (and lovely!) photos. 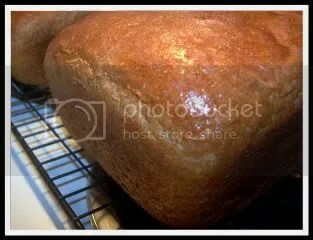 To make Soft Wheat Bread, substitute 2-3 cups wheat bread flour for all-purpose or unbleached bread flour. I did 3 cups of wheat to 3 cups of unbleached (half and half), but next time I might try 2 cups of wheat flour and 4 cups of unbleached, just to see what happens with respect to the rising ‘issue.’ I will also try my best to make bread on the weekends, when I’m not running willy-nilly all over the place from job to job to house to karate to wherever! 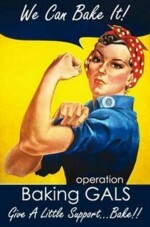 Now go forth and bake bread. You will not regret it. 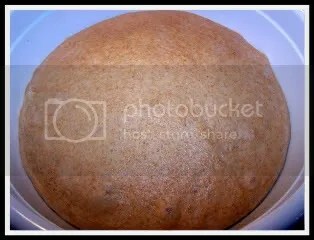 This entry was posted in Cooking, Food and tagged Baking, Bread, Food by Kate. Bookmark the permalink. You’re welcome! And your loaves look fabulous! Great job!